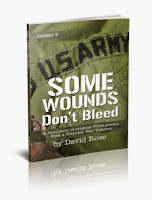 A collection of original poetry from a Vietnam War Veteran, David Rose, who is diagnosed with PTSD by the Veterans Administration. Some of these poems are very personal and dark while others are lighter, but I wanted to make them available to the public as an educational tool to everyone who is interested. The poems are copyrighted, but can be used for any nonprofit reason with credits. It is my sincere wish that someone will find these heart-felt writings useful. These poems are available in a book format. Click on the image to buy the book on Amazon. PTSD Narrative by Robert R.